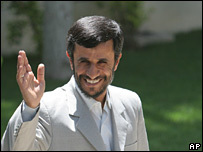 Iranian President Mahmoud Ahmadinejad has joined a burgeoning international community - by starting his own weblog. Mr Ahmadinejad's first posting, entitled autobiography, tells of his childhood, Iran's Islamic revolution, and the country's war with Iraq. 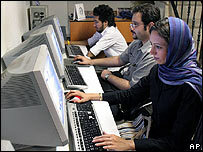 The move by Mr Ahmadinejad comes amid continuing internet censorship by the Iranian government. Mr Ahmadinejad's first entry on his blog, which is available in Persian, Arabic, English and French and includes an RSS feed to get future new entries to readers, is dated Friday. He begins by telling users of his humble origins. "During the era that nobility was a prestige and living in a city was perfection, I was born in a poor family in a remote village of Garmsar - approximately 90 kilometres west of Tehran," he writes. His father was a "hard-bitten toiler blacksmith" and a "pious man", who had decided to move the family to Tehran when Mr Ahmadinejad was just a year old. The US is also heavily criticised by the president. At one point he describes it as "Great Satan USA" for what he says was its support for the "terrorist groups" which had tried to collapse Iran's Islamic government. It is not yet clear how well Mr Ahmadinejad's blog will be received. User figures already appear high - by 1100 BST on Monday, nearly 12,000 people had taken part in the online vote. Meanwhile, in a move some suggest is part of the same search for a wider international audience, President Ahmadninejad also gave a rare interview to American television. In extracts broadcast by the BBC on Monday, Mr Ahmadinejad condemned President Bush for wanting to solve the world's problems by force, and for "blindly supporting" Israel in its conflict with Hezbollah. He also flatly denied Iran was seeking nuclear weapons. "We want to have access to nuclear technology. We want to produce fuel," he said. "Do you not think that the most important issue of the world of tomorrow will be energy? We think that Mr Bush's team and the parties that support him want to monopolise energy resources in the world." The BBC's Bridget Kendall, at the United Nations, says Mr Ahmadinejad's decision to reach out to speak America at this moment - in the wake of the Lebanon conflict - was no accident. President Ahmadinejad wanted to play on all the doubts about American foreign policy, and counter the notion that Iran is run by mad mullahs trying to get nuclear weapons, our correspondent says.